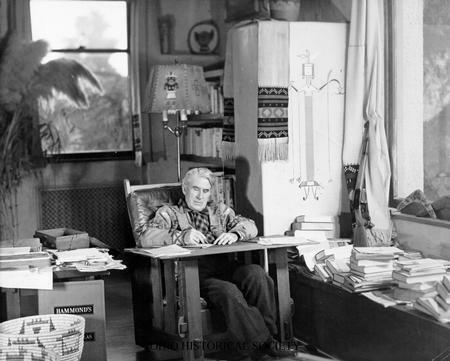 We have done some "fall cleaning" and reorganization of our house, and that has included a new "Zane Grey" writing chair for me. 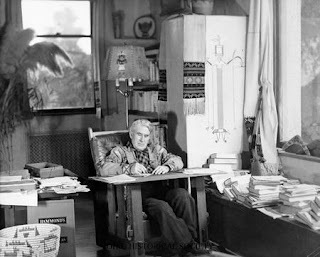 After we moved the guest bed out of my office room, I told my wife that I'd like a comfortable chair to write in, like Zane Grey had. I suggested buying a lawn chaise lounge and putting a blanket over it. That comment fits with my frugal temperament. My wife later emailed me and asked if it would be okay to spend somewhat more on the chair, sending me some online examples. 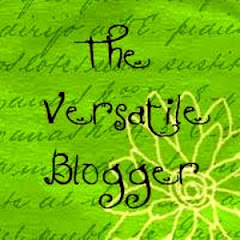 I suggested that we try a local furniture store where we had bought furniture before and also had had some specialty pieces made: Central Park Home Furnishings and Futon Shop. We found my "Zane Grey" chair there. A few years ago, the bookshelf in the background was also purchased through Central Park, who contracted with a local cabinet maker to have the piece made. Now, of course, I just have to get the time to use it. An early Merry Christmas to me! (sorry, didn't realize the little respond window didn't publish comments. I owe you some now. Sometimes we have to be nice to ourselves!